By the turn of the century Manitoba was into its Boom years. The province was wealthy and ambitious and architectural projects abounded. 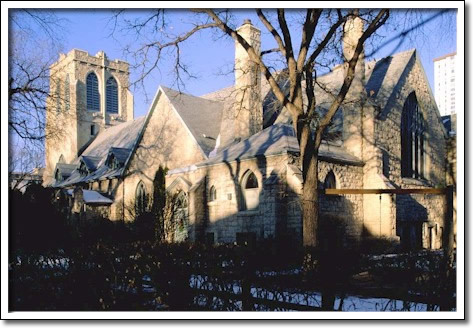 Churches were a special focus for this activity, and St. Luke's Anglican, from 1904–05, is an exceptional example of design following the Gothic Revival style. The main building was designed by Winnipeg architect C.F. Bridgeman while the attached parish hall was designed by Winnipeg architects Woodman and Carey and constructed in 1913–14. The glories of the building are not confined to its exterior. The church is noted for its stained glass windows and wood carving. The Toronto studio of Robert MacCausland and Co. produced most of the glass in the nave, with one special window constructed by the world-renowned English firm of William Morris and Co. The carved wooden rood-screen is a magnificent example of craftsmanship, designed by parishioner and architect C.E. Chivers. Behind the font is the first wood carving executed by artist Leo Mol.